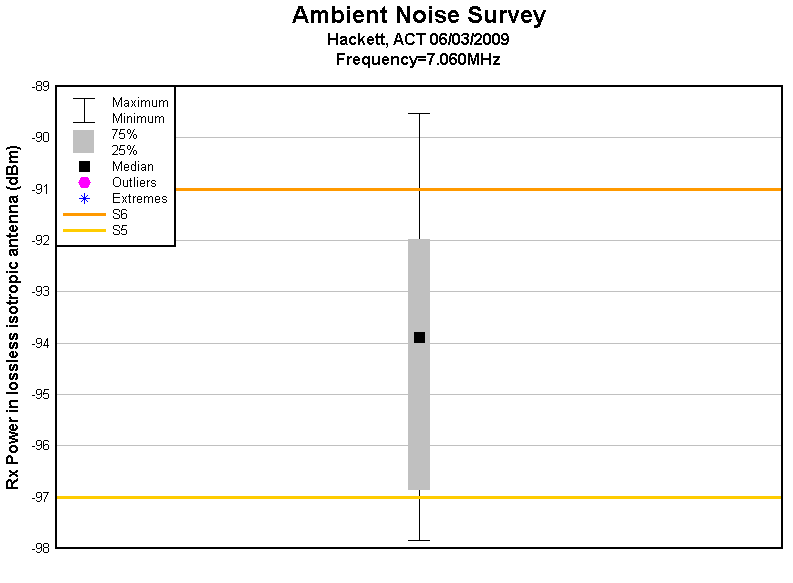 This article documents a small survey of ambient noise at 7.060MHz in the north Canberra suburb of Hackett in a residential environment. Measurements were made on a clear 2kHz wide channel as close as practicable to 7.060MHz at ten locations from a vehicle parked at the roadside, shown in Fig 1. 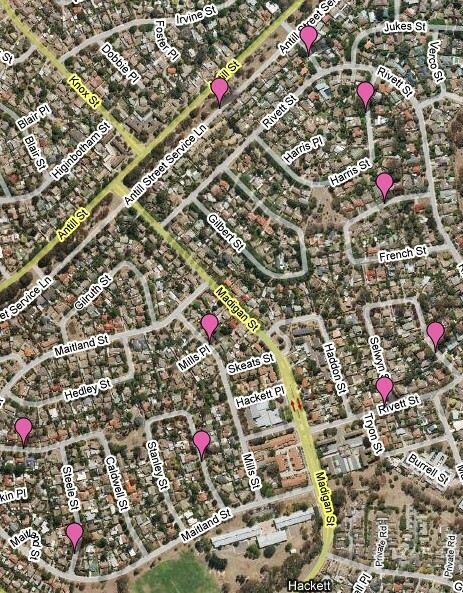 Five measurements were made at each location, so there are 50 measurements in the Residential area spread over ten locations. Antenna details and calibration assumptions are at http://www.vk1od.net/antenna/m40/index.htm . The FSM data records of the observations is available for download in the Excel spreadsheet of observations. 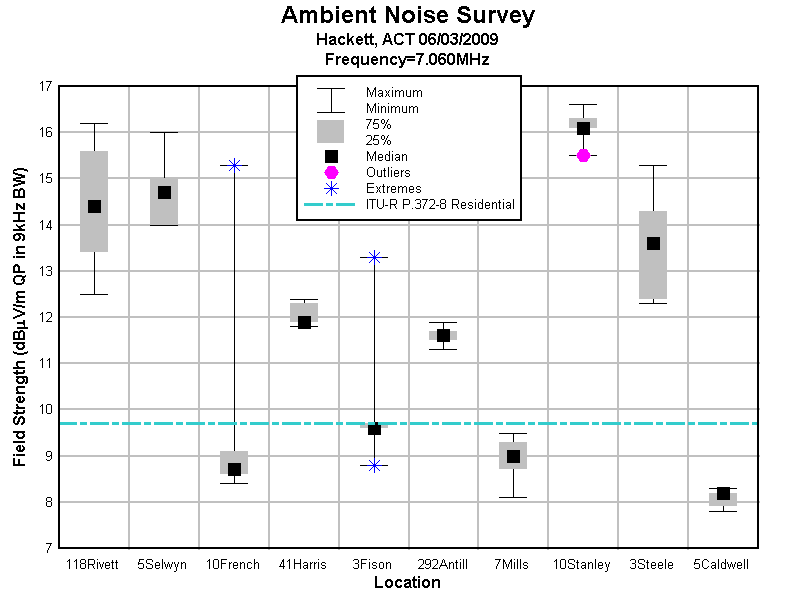 Fig 2 shows the distribution of measured ambient noise at each location. Fig 3 shows the distribution of receive noise power expected in a lossless isotropic antenna based on the ambient noise measurements. The median value is between S5 and S6 using the convention that S9=50µV in 50Ω. This is a very limited survey of locations chosen at random. The residential locations are old North Canberra, rear spine LV AC distribution mainly in flat 4 wire three phase configuration with some limited ABC, HV is on the street. Measurements were not made in extreme situations, eg under HV lines, adjacent to transformers, in the middle of any parks, around shops or schools. A larger survey could afford a representative sampling of prospectively higher and lower noise locations and may show a slightly larger range but probably with a similar median. The greatest contribution to uncertainty is the Antenna Factor of the helical whip on the vehicle. Directivity is less an issue than the assumptions of current distribution, therefore the effective height, and the voltage drop due to loading by the receiver as a termination.